"After I slaved all day over a hot Telephone Book, looking for just the right name! Yours was really stupid! That's why I chose you.....to be the first victim of Carnage!" Carnage to victim. Ahhhh, Where it all began! I wanted to kill the guy. No, no not my editor--he signs the checks! Actually, I wanted to kill Venom. I would have to, if not for...ah, but I'm getting ahead of myself. In the beginning, there was an alien symbiote that Spider-Man had brought back from a distant planet. Emulating a sentient, black and white costume, the creature tried eventually to bond permanently with Peter Parker, everyone's favorite web-slinging wonder. However, Spidey fought back and in the course of the battle it wound up sacrificing itself at the last moment to save Spider-Man. Then a year or two later when I began writing for the Amazing Spider-Man, a new villain was called for, and I resurrected an idea I'd begun developing in another book. As a result, I brought back the alien, joined it along with superstar artist, Todd McFarlane--introduced VENOM to the world! Things went pretty well. Writing the character was allot of fun. But since I had planned to stay on Amazing for at least 20 to 30 years, I started thinking about the future--and I got a dangerous idea: since Venom had his first story in Amazing 300, why not have his last story in Amazing 400! Yeah! I could kill Eddie Brock off, then have the costume wonder around the Marvel Universe for a year or two, joining with various other characters, before settling in on another host and becoming the "New Venom"' Imagine the nifty stories if the symbiote joined with Doctor Octopus, the Lizard, or J.Jonah Jameson! It sounded like a great idea, but then something unexpected happened---readers absolutely loved Venom! As popularity and sales rose, it became increasingly obvious that Marvel would never let me actually waste comic-dome's favorite slavering symbiote. O what to do! Then came the answer: if we couldn't have the existing symbiote join with someone else, why not create another one? Since the alien was of an unknown species, it seemed reasonable that it might reproduce asexually, spawning a seed that would become a creature similar to itself. Ah, but who would join with it? Though psychotic, Eddie Brock had a deep, if twisted, sense of justice which drove him to protect innocents. (At least when he wasn't busy trying to turn Spider-Man into gut jam!) I thought that it might be an interesting contrast to the unique dichotomy to give Venom like power to a total sociopath, someone without a hintof redeeming value, a lunatic who'd eat babies for breakfast and ask for seconds. Enter Cletus Kasady. 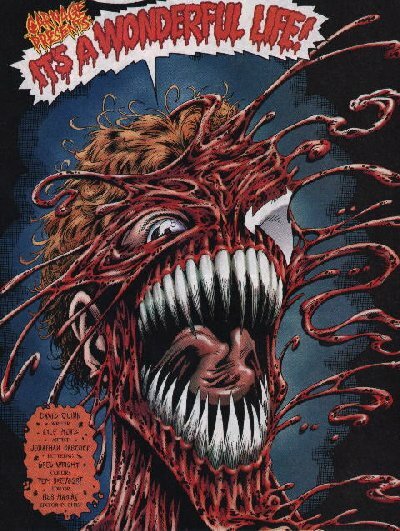 An unrepentant mass murderer, Cletus was Eddie's cell mate in prison, and thus became the eager recipient of Venom's spawn when the symbiote gave birth while breaking Eddie out. Okay, we had our new character--what would we name him? No problem I thought: we'll call him CHAOS! After all, that's what Clete wants to bring to the world right? Perfect! Until a rival company came out with a character by the same name a couple of weeks later. The artist Mark Bagley proposed Ravage! Again it was perfect! Until we found out that Marvel had a book in the works called Ravage 2099. Finally the assistant editor Eric Fien suggested casually, not knowing that he was about to make history, "How bout Carnage?" Once more, the name was perfect. And even better, this time no one else was using it! Which left us with one problem: What would the character look like? How would we maintain the visual connection to Venom while still making the new guy an individual unto himself? I posed the possibility that he could look like Venom, but that his costume would be multi-colored, constantly reflecting the chaotic nature of the man inside. Not being an artist, I didn't realize that that would put anyone who tried to draw it in a padded cell real fast! That's when Mark Bagley came up with the design we ultimately used, successfully retaining the constant change motif, but with a much more workable and effective, red and black color scheme. Seeing how Mark drew the character gave me ideas on how to use it, and between us we put together one nasty dude. Space for this web page is provided as a service to Tripod members. The contents of this page are the responsibility o its creator, not Tripod, Inc.
Click here to buy a Tripod T! Tripod | ScreenLife | Planet Tripod | Search Member Pages | Build Your Own Web Site!